It’s difficult to imagine a world before Chris Corbin and Jeremy King came along and lured us all back into full-blown gastronomic retro-extravagance. 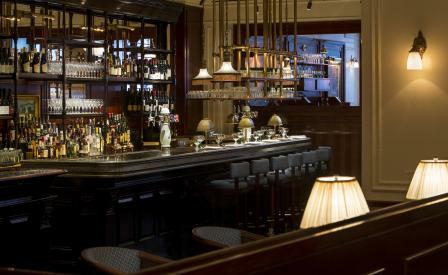 From Le Caprice in 1981 to the Ivy in 1990 to the Wolseley in 2003 and more recently Fischer’s in 2014, the pair have not made a misstep in delivering unexpected treats to the jaded London diner. Their impeccable reading of the zeitgeist shows no sign of faltering with the recent opening of the all day Alsatian brasserie, Bellanger in trendy Islington. Shayne Brady of Brady Williams has styled the handsome interiors of the former Brown’s Bar in sumptuous Belle Époque trappings, dividing the space into three moods including one with beveled mirrors, blue banquettes, wood panel and antique chandeliers. It’s almost as if Zola is coming to lunch. And if he did, he would have found plenty to enjoy from head chef Lee Ward’s evocative and gutsy menu – a tarte of flambéed mushrooms and herbs vies with Toulouse pork sausages bathing in red wine, while sweet-tooths will struggle to choose between the rarely seen apricot and cream tarte Tropézienne and chocolate pot. And with London still mulled in wintery chill, now’s as good a time as any to raise a toast to Corbin and King’s next tasty venture with a schooner or two of Alsace-Lorraine beers.